Discover Comfort… Discover Style… Discover Support. Comfort Genie Bra is the answer to every woman’s wish. No more wires. No more hooks. No more adjusting straps! Just a comfortable, stylish bra. The secret is in the everlast comfort stretch fabric. 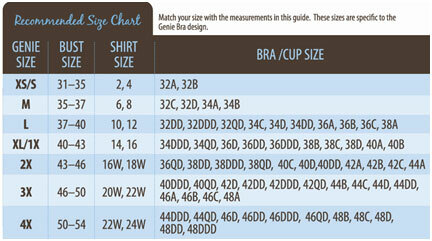 This fabric allows the Comfort Genie Bra to custom conform to your shape, move to your shape, and never lose its shape! It also provides all the comfort and support you need with the wide lift comfort band and a natural lift with the soft, full-coverage support pads. The band prevents embarrassing bulges and rolls. With the Comfort Genie Bra, prepare yourself for a comfortable, younger, and smooth look!